Millions of South Africans are casting their ballots on Wednesday as South Africa holds its fifth national election since becoming a full democracy in 1994. Voting is now underway in 22263 polling booths across South Africa for both parliamentary and provincial elections, with South Africa’s Deputy President and ANC leader Kgalema Motlanthe among the first to cast their ballots this morning. “We appeal that voters be patient, conduct themselves in an orderly manner and work with the IEC and security officials,” said a government statement on Wednesday morning. “In the spirit of the year-long celebration of 20 years of freedom, government joins the nation in anticipating a peaceful day of voting countrywide,” said South African government spokesperson Phumla Williams. 25.39 million voters have registered to vote according to South Africa’s Independent Electoral Commission (IEC). 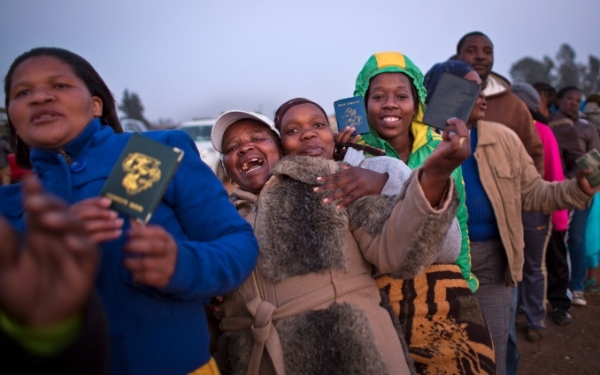 At more than 100 South African embassies across the world, non-resident South Africans were also able to cast their vote for the first time. Meanwhile, observer missions from the African Union, Southern African Development Community (SADC) and the Commonwealth are spread across all nine provinces in South Africa to monitor the polling. Although the ruling African National Congress is widely expected to retain power, it has been dodged by corruption allegations and is struggling to arrest its slide in popularity. “The precious right to vote was gained through relentless struggles and sacrifices. Therefore, on the 7th of May, let us go out in our millions to vote and celebrate our hard won freedom and democracy. Let us vote to consolidate democracy and all the achievements of our young nation,” urged President Jacob Zuma in his address on Freedom Day celebrations in Pretoria in April. Institute for Security Studies (ISS) elections analyst Jonathan Faull said voter turnout was critical. “In general, high turnout nationally is good for the ANC, and low turnout better for the DA. In the context of the national election, high and ascendant ANC turnout in KZN could prove to be critical for the ANC due to its role in offsetting ANC losses in other provinces,” he said. Polling closes at 1900 GMT on Wednesday and the final outcome would be known in the latter part of the day on May 8.